Essentially, anti-vax networks are highly conspiratorial, self reinforcing, tend to harden beliefs very effectively, and tend be very resistive to change or correction. This does make it difficult to counter the harm that they do, but the more insight we gain the more nuanced and effective our responses can be. The study also found that the movement is highly ‘feminised’. This does not mean that vaccination is a ‘feminist’ issue, nor does it reflect poorly on women. Rather this merely reflects the gender roles that still persist in our society. While child care is still predominantly left (or pushed) to women, it is natural that more women become passionate about issues and decisions that affect children. One should be wary of highly gendered headlines on this issue. 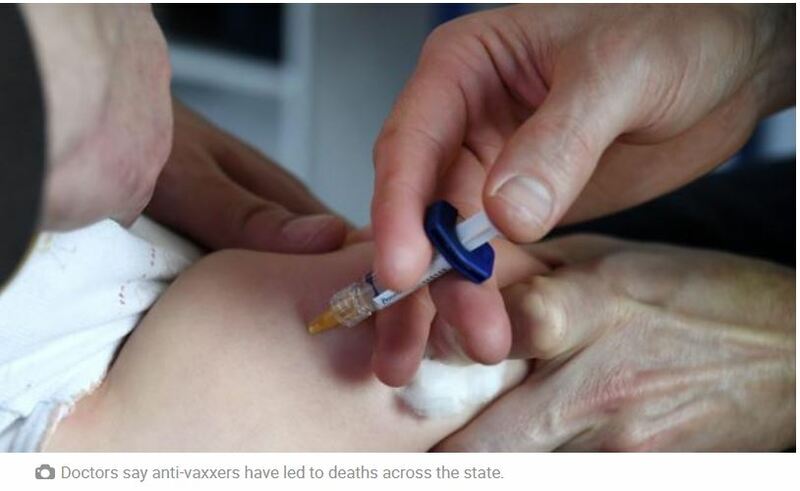 NSW children die from ’preventable’ diseases: Fifty-four NSW children have likely died from diseases for which a vaccine was available, and almost half of the deaths over the past decade were considered ‘preventable’. Nutritional nonsense detection kit: A useful tool for assessing the multiple dietary claims currently saturating the media. How to counter the circus of pseudoscience: It is a cognitive bias known in psychology as the Dunning-Kruger Effect. In short, the less you know, the less able you are to recognize how little you know, so the less likely you are to recognize your errors and shortcomings. For the highly skilled, like trained scientists, the opposite is true: The more you know, the more likely you are to see how little you know. This is truly a cognitive bias for our time. If you don’t have coeliac disease, avoiding gluten isn’t healthy: For people without coeliac disease, there’s no evidence to support claims a strict gluten-free diet is beneficial for health. It’s even possible the opposite is true, and the avoidance of dietary whole grains resulting in a low fibre intake may be detrimental. Given gluten-free foods cost around 17% more, perhaps it’s time to reconsider a strict gluten-free diet chosen for health benefits alone, and instead include a diversity of gluten and gluten-free foods, with dietary variety as the key. Explainer: How does sunscreen work, what is SPF, and can I still tan with it on? A hot summer sees many Aussies heading to the beach – with trusty sunscreen in hand. But sunscreen isn’t a perfect shield against burns and damage caused by UV. Check out this explainer for tips on how and how often to apply sunscreen this summer. The development of medical triage. The result of accumulated efforts across the world and the centuries, the modern emergency medicine practice of sorting patients to be seen in the order of urgency has its origins on the battlefields of multiple wars. In some cases, improved screening procedures could be responsible for fewer cancer deaths and bowel screening which may remove precancerous polyps may has reduced incidence of colorectal cancer. Public health measures such as prostate screening and reducing the burden of smoking are huge contributors to the reduced incidence of prostate and lung cancers. Improved treatment for many cancers, particularly haematological malignancies, have vastly improved survival rates over the last few decades. Ten of the most important diseases with no licensed vaccine: Vaccines have been very important for the control of quite a number of infectious diseases and have resulted in a great reduction in childhood mortality. The 20th century saw the complete elimination of smallpox, a near-complete eradication of polio and huge in-roads into abolishing common infectious diseases like measles, chicken pox, diphtheria, German measles, whooping cough and mumps. And despite the activity of anti-vaccine organisations, the incidence of these formerly-common infections has been vastly reduced as well as the dismal death toll seen earlier in the 20th century. However, there are still a number of diseases that lack an effective vaccine, ten of which are presented here. There are a number of characteristics some of these diseases have that differ from the list of illnesses above. 1) They are not diseases commonly seen in temperate areas, 2) They are vectored (carried) by insects or snails, and 3) The largest vaccine markets for these diseases are in impoverished nations. (The exceptions are the human-spread viruses RSV, HIV and CMV.) This makes these diseases less attractive for vaccine formulation; however, scientists are working on vaccines for a number of these diseases and hope to benefit untold millions of people. Imagine if we had a vaccine for malaria! The bogus arguments that the Government uses to support quack medicine: There is often pressure to ‘integrate’ medical practices, ‘because the public demands it’ or ‘because at least it helps a lot of people a little’. Such arguments amount to an “argument from popularity” . Such arguments are not a good reason to bow to pressure for alternative medicine. Har Gobind Khorana: Who was the man who helped unlock the secret of DNA? The biochemist responsible for discovering an essential function of our DNA — and for constructing the first synthetic gene — is being honoured by Google with a Doodle in many parts of the world.